Sir Richard Branson vows his Virgin Galactic space tourism company will not be grounded by a test flight crash that killed 39-year-old co-pilot Michael Alsbury and seriously injured pilot Peter Siebold, who parachuted to safety. The accident happened Friday when SpaceShipTwo exploded after it was released at 45,000 feet by its carrier craft over the Mojave Desert in southern California. The National Transportation Safety Board is investigating the accident, and acting chairman Christopher Hart said it may take a year for the agency to draw any conclusions. However, initial reports indicated a device designed to slow the spacecraft on re-entry activated without a command from the pilots. Hart said the ongoing investigation will not prevent Virgin Galactic from going ahead with its operations. In an interview with the BBC over the weekend, Branson would not speculate if the accident will delay the launch of his first scheduled space flight next year. 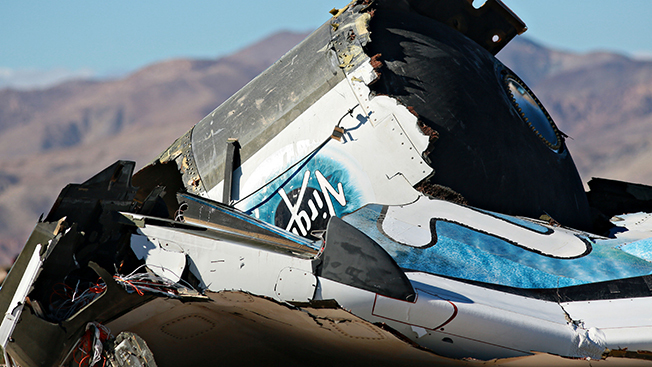 "It's a horrible day for Virgin Galactic and commercial space travel," he said. "It's a massive setback … We owe it to our test pilots to find out what went wrong, and once we find out, if we can overcome it, we will make sure that the dream lives on." On Friday, Branson wrote in his blog post: "We've always known that the road to space is extremely difficult—and that every new transportation system has to deal with bad days early in their history." Branson offered a refund to any passenger who wanted one, but reportedly, no one has asked for their money back. And the Times said one person actually signed up after the accident to show support for the program. More than 700 would-be astronauts, including celebrities Leonardo DiCaprio, Aston Kutcher and Justin Bieber, have ponied up $250,000 to rocket to the edge of space on board a Virgin Galactic flight, which requires G-force training before boarding. Some prestige advertisers have also hitched a ride on the project and are counting on Branson to maintain his fierce entrepreneurial streak. In late September, Virgin Galactic announced a partnership with French vodka maker Grey Goose during a symposium entitled "The Future of Travel: Are We Moving Fast Enough?" The two brands promised signature cocktails will usher in the first Virgin Galactic flight—presumably before the bonds of Earth are broken. In other deals, Land Rover will transport travelers, Hotel Encanto de Las Cruces will lodge them, and World Class Gourmet will feed them at Virgin's Spaceport America in Sierra County, New Mexico. Could the accident end these and other brand sponsorships? It's a difficult question since private space travel is an entirely new business segment, one without the benefit of precedent. Spectacular crashes have led to dissolution for conventional airlines TWA, Pan Am and ValuJet. On the other hand, the risk of space travel is hardly lost on the public, and Branson himself has long pushed the envelope with his Virgin brand, which has come to signify adventure travel with panache. His around-the-world ballooning exploits are an example of his company's can-do-anything ethos.